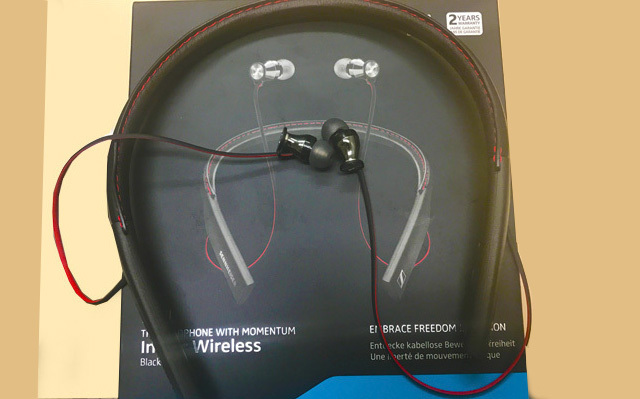 In 2015, Sennheiser released the most loved over-the-air Bluetooth wireless headphones to date, the Momentum 2 Wireless. These headphones feels outdated now, especially since the updated model, the PXC 550, is cheaper and has a better highs and more defined mid- level sounds. Still, PXC 550 headphones cost nearly $400. Sennheiser has recently released the HD 1 In-Ear Wireless headphones that cost $199. They are not only aptX compatible, but AAC (iPhone) as well. The sound isn’t as full as that on the PXC 550 headphones, but it’s as close to sound bliss as one can get. The HD 1 buds can actually fit in your pocket, although you’ll have to do a little bit of bending. The HD 1 headphones are certainly a better buy than the Bose QuietControl 30 Wireless in-ears, which don’t sound as good, even though they are decent headphones as well. Bose headphones offer a warmer sound, with bass containing sonic feet that kick you in the ears but feel like they are covered with socks. The bass on the HD 1 headphones takes off the socks and the kick has more impact — and this is usually a good thing, especially when listening to EDM or dance music. The QC30 in-ears offer something that the HD 1 in-ears don’t–active noise cancellation. However, the HD 1s fill your ears so much that the passive noise isolation is better than the active noise cancellation on the Bose model. The Sennheiser HD 1 Wireless in-ear headphones are very stylish. In terms of design, the HD 1s look stylish, and the leather band feels nice on your neck. The buttons on the right side are easy to press, and you will never accidentally rewind or pause your song when you don’t intend to. 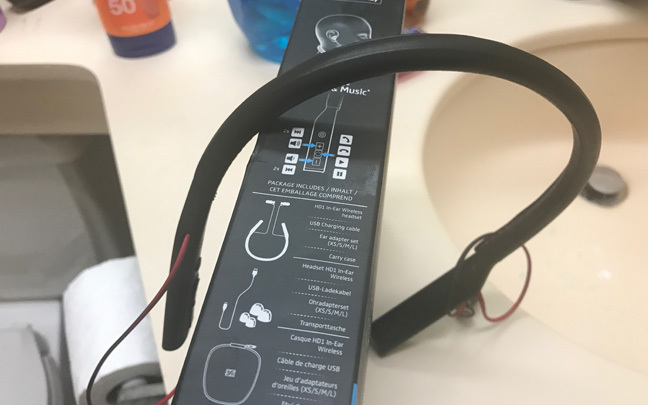 Unfortunately, like the Bose QC30s, the band has a habit of twisting to one side or the other, especially when exercising, which these were made for. As with other in-ear headphones, you will need to select the right buds (HD 1 comes with three pairs) in order to get the perfect fit, which will give you the perfect sound. The buds may hurt your ears during the first day of use, but your ears will certainly adjust to them. In terms of phone quality, these Sennheiser in-ears don’t match the quality of the Bose QC30s, which offer the most clear calls out of any in-ear headphones available on the market. When using the HD 1s, people I talk to say that although I sound decent, they can definitely tell that I’m on a headset and can hear background noise. The quality for phone calls is still acceptable and shouldn’t be a deal killer if you are considering the HD 1s. The battery life on the HD 1s is impressive and will give you at least 10 hours of use between charges, which is more than the Bose QC30s. Unfortunately, if your battery runs out, charging them takes more time than it does for other similar headphones. The HD 1s, like other in-ear wireless headphones, do not work without the battery. When Apple announced that they were getting rid of the headphone jack in 2016, many people became angry for the right reason — Bluetooth wireless sound still isn’t as good as wired sound. But with the Sennheiser HD 1 Wireless in-ear headphones, wireless audio comes as close to perfection as it can — at least for now. This entry was posted in Review and tagged Bose QC30, Sennheiser HD 1, Wireless Headphones. Bookmark the permalink.